Two years ago on March 25 our family's life would change in the blink of eye! As I went to put Makenzie in the car she reached down and grabbed a Red colored Goldfish cracker out of her car seat. Makenzie hated to be in her car seat and began to cry. When she opened her mouth I saw the cracker but it was too late. One gasp and she wasn't breathing. As my whole family stood in the parking lot our little princess was dying. After preforming the Heimlich unsuccessfully, I got on the phone with 911 and rushed her into the store. As soon as I hit the door she went limp in my arms. As my husband and the people in the store tried to help our daughter I stood out side of the store banging my head pleading with God not to take my baby away from me... He didn't! The paramedics arrived, got a airway and rushed her to the nearest hospital. When we got there we found her on a vent and totally unresponsive. She was then airlifted to another hospital more equipped to help her. After a week on the vent and sedated she was breathing on her own but still in a coma. We received MRI results stating that Makenzie had a very serious global Brain injury. She was then transferred to Children Hospital where we spent 5.5 weeks in a rehab program before we got to take her home. When we took Makenzie home she cried EVERY waking moment of every day! She did not sit, eat, talk, walk,crawl, smile, laugh, see, or hear. She was fed through a tube in her stomach and didn't respond to anything! We have spent the last 2 years fighting with her and for her. We have done many conventional and unconventional therapies. Today Makenzie has come a long way but has a long way to go! She can see, hear, smile, laugh, she loves her brothers, playing peek-a-boo, standing in her walker, she can roll over on her own sometimes, she is getting close to sitting, and the list goes on! With God's Grace Makenzie will continue to heal. 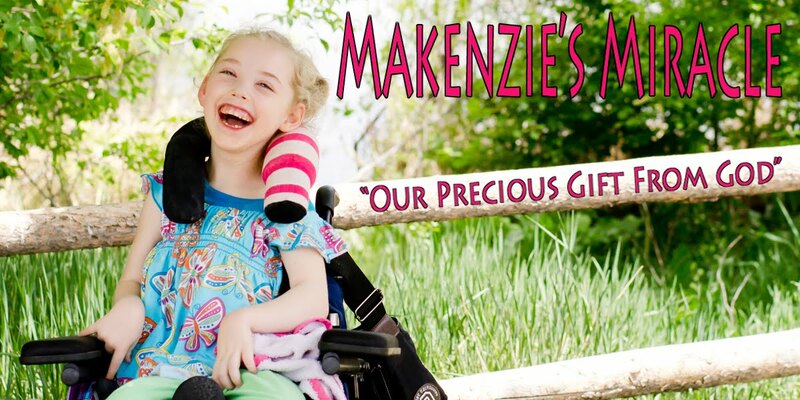 We have Hope for the future and are so proud of Makenzie for never giving up! Keep Fighting Baby Girl. Heart dropping - I am so sorry to rea and learn about Makenzies chocking incident. . .aughh what a heartbreaker! How thankful I am that God deliverred her from death!! She is a beautiful girl !! this one of the most touching stories ive ever read in my life and i no od will cure makenzie and she will be right back to her old self. i just know it! Thanks for the people who are sharing information about cerebral palsy on this website. And thanks for maintaining this useful website. You may visit About Cerebral Palsy to find some more good information about cerebral palsy. You can even send questions to doctors and get feedback and see if people with cerebral palsy will be eligible for lifetime benefits. I am a friend of Donna Collier in Tampa, Florida and I am praying for your daughter and your family. I have taken the liberty of copying a picture of Makenzie and will be taking it to our church prayer meeting on Monday for them to begin praying for her complete recovery. She is beautiful. Reading your story has brought me to tears. I can only imagine how hard it would be to see your little girl go from being perfectly healthy to having a brain injury in a matter of moments. Thank the Lord that he did not take her from you that day. I know first hand how scary it can be to watch your child choke. My 5 yr old daughter Makenna choked on a whole grape this past summer. It was the scariest moment of my life. Thankfully I was able to dislodge it by giving her the heimlich maneuver. She started crying, and I was shaking and crying, and just grabbed her and hugged her and never wanted to let go. I am going to add your family to my prayers. I hope Makenzie gets stronger every day and that the Lord will perform amazing miracles in her life. Thank you for sharing your little miracle. She is so beautiful.